The Church Service : Italian Weddings last as long as an entire day or even pull out the start of the next day. Performing church services early in the morning is an integral part of the ceremonies involved in an Italian Wedding. 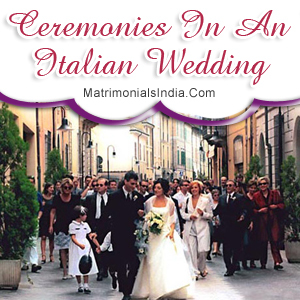 The Wedding Ceremony : A traditional Italian Wedding Ceremony generally takes place in the afternoon time. The tradition of exchanging engagement rings and gold wedding bands by the couples is very common. The Wedding Ceremony usually encounters a large number of guests. Borsa, a white colored small sating bag, is carried by the bride to place all the money and tiny gifts offered by these guests. Merry making and drinks are enjoyed by the newly married couple as well as the guests till few hours after the wedding. The Wedding Reception : Wedding feast held at the reception is one of the most important parts of an Italian wedding. More than 13 food courses are served to please the taste buds of all the wedding guests. Serving soup made of meatballs, rice and Parmesan cheese as one of these food courses is a common tradition. Offering little bags of candied almonds to the guests is also a special tradition of an Italian Wedding reception. Enjoyment and dancing are followed far onto the early hours of the next day by the newly wedded couple and guests. To conclude, it can be said that Italian Wedding is indeed one lavish indulgence. It not only celebrates the love between the bride and groom, but also stands as a testimony to the long going and rich Italian cultures and traditions.